Upland - Service Areas - Services - Allied Commercial Real Estate, Inc. The City of Upland was incorporated on May 15, 1906, and is nestled at the base of the San Gabriel Mountains. During the 20th century it has developed into a residential and retail community in which maintains its country and urban ambiance. Upland has also retained its charm of the past. The Upland Town Center is quiet, leisurely place to shop in antique stores, custom shops, and visit fine restaurants. Each Thursday evening (during spring and summer) the Town Center is host to the "Second Avenue Market", a certified Farmer's Market. 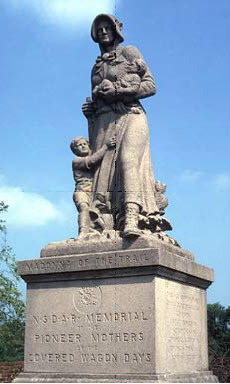 Madonna of the Trails Statue: This memorial to pioneer mothers was erected in 1929 and dedicated by the Daughters of the American Revolution-San Antonio chapter. One of 12 Madonna statues in the United States, it is located on Historic Route 66 at the Euclid Ave. intersection. Bridle Path Trail: Walkers, joggers, bicyclists and horseback riders enjoy this picturesque trail, which stretches from Foothill Blvd. north on Euclid Ave. to the mountains. ChaffeyCommunities Cultural Center: The Cultural Center promotes history and culture through a variety of community programs during the year including lectures, concerts, performances, and exhibits. Its restored Craftsman-style chapel is available for rent for special events such as weddings, receptions, and meetings. Grove Theater Productions: Presents locally produced plays and musicals in what is considered one of the best live theaters in Southern California. A recurring piece of public statuary stands in twelve locations from Maryland to California, tracing a historic travel route from "covered wagon days." The statue is the Madonna of the Trail, an 18-ft. tall tribute to the pioneer mothers who traveled west with their crazy husbands. The Madonna of the Trail is a pinkish, stony-faced pioneer Mom, in long dress and bonnet, strutting westward with a rifle on one arm, an infant on the other, another little cruncher grasping Mom's skirt. The Madonna’s of the Trail were a project of the National Society of Daughters of the American Revolution, dedicated in 1928-29. They are strung along the National Old Trails Road, now mostly Rt. 40. Artist August Leimbach created the mold. The poured algonite stone sculptures -- a mixture of crushed marble, Missouri granite, stone, cement and lead ore -- are identical. Upland Golf Course and Red Hill Country Club offer both public and private golf courses, well-maintained and challenging for duffers and handicappers alike. Residents are just 30 minutes from renowned Mt. Baldy Ski Resort, and 45 minutes from coastal beaches, the San Bernardino Mountains and breathtaking desert recreational areas. The Equestrian Center trails and network of bike/hike paths provide outdoor recreation surrounded by nature’s own handiwork. Upland’s parks and a wide and varied slate of recreation programs include sports for all ages and fun-filled summer activities for children. Call (909) 931-4280 for more information about programs. 1,328 ft. at the intersection of Foothill Blvd., and Euclid Avenue (center of city); 2,000 ft at the intersection of 24th Street and Euclid Avenue (northern city boundry); and 1, 175 ft. at the intersection of 7th Street and Euclid Avenue (southern city boudry). The Official City of Upland benchmark is located in the vicinity of Upland City Hall, 460 N. Euclid Avenue. A 2-inch brass disc is set in the southwest corner of a 3x3 ft. concrete base for a light standard, 104 ft. east of the centerline of Euclid Avenue and 185 ft. south of the centerline of Arrow Highway - elevation: 1,253.32 ft. above sea level. (Based on the U.S. Coast & Geodetic Survey Datum as provided for in the City of Upland Municipal Code, Ordinance No. 1400). The majority of the future Foothill Freeway in Upland is located between 19th and 20th Streets. The freeway is generally depressed between Benson and Campus Avenues. Exits are planned for Mountain Avenue and the new alignment of Campus Avenue. The western portion of the freeway, between La Verne and Fontana is anticipated to be complete in the Fall of 2002. The eastern portion of the freeway, between Fontana and Redlands was completed in 2007.